Sever's disease, also known as calcaneal apophysitis, is a medical condition that causes heel pain in one or both feet of children during the period when their feet are growing. Sever's disease occurs most commonly in boys and girls between the ages of 8 and 14 years of age. Sever's disease occurs when the part of the child's heel known as the growth plate, or the calcaneal epiphysis, an area attached to the Achilles tendon, suffers an injury or when the muscles and tendons of the growing foot do not keep pace with bone growth. The result is constant pain experienced at the back of the heel and the inability to put any weight on the heel, forcing the child to bear weight on their toes while walking. A toe gait develops in which the child must change the way they walk to avoid placing weight on the painful heel, a position that can lead to other developmental problems. The most common symptom of Sever's disease is acute pain felt in the heel when a child engages in physical activity such as walking, jumping or running. Children who are very active athletes are among the group most susceptible to experiencing Sever's disease because of the extreme stress and tension they place on their growing feet. Improper pronation, the rolling movement of the foot during walking or running, and obesity are all additional conditions linked to causing Sever's disease. The first step in treating Sever's disease is to rest the foot and leg and avoid sports activity which only worsens the problem. Over the counter pain medications targeted at relieving inflammation can be helpful for reducing the amount of heel pain. Combined with rest and pain medication, a child with Sever's disease should wear shoes that properly support the heel and the arch of the foot. Consider purchasing orthotic shoe inserts which can help support the heel and foot while it is healing. 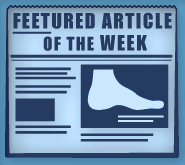 Most patients with Sever's disease symptoms report an eventual elimination of heel pain after wearing orthotic insoles that support the affected heel. Sever's disease may affect just one heel of either foot as well as the heels of both feet. It is important to have a child experiencing heel pain get an examination by a foot doctor who can apply the squeeze test, which compresses both sides of the heel in order to determine if there is intense pain. Discourage any child diagnosed with Sever's disease from going barefoot as this can intensify the problem. Apply ice packs to the affected painful heel two or three times a day for pain relief. Treatment methods should usually continue for at least 2 weeks and as long as 2 months before the heel pain goes completely away and the child can resume normal physical and athletic activities again. A child can continue doing daily stretching exercises for the legs and feet to prevent the heel pain of Sever's disease from returning.